Both sites exist as earthworks but are both on private land although both can be viewed from public rights of way. Some thirteenth century masonry survives as part of the (extensively rebuilt) manor house occupying the site of Ascott d’Oyley Castle although this is now part of a private residence. Ascott d’Oyley Castle. The earthwork remains consist of some shallow ditches and a raised earth platform. A tree covered motte is also on the site although on private land with no public access. Ascott Earl Castle. 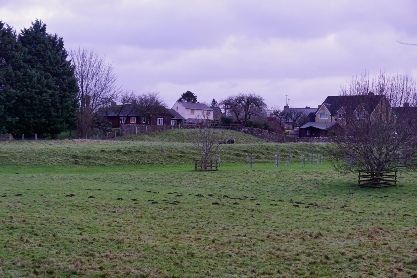 At the other end of the village are the remains of another motte-and-bailey castle. Less is known about this structure but it was probably contemporary with that at Ascott d’Oyley. Notes: Both castles are located at opposite ends of Ascott-under-Wychwood but neither are sign-posted. The best car parking option is at the railway station but on-road parking is possible in several locations. Ascott-under-Wynchwood is unusual for originally having two contemporary fortifications in close proximity - Ascott d'Oyley Castle and Ascott Earl Castle. 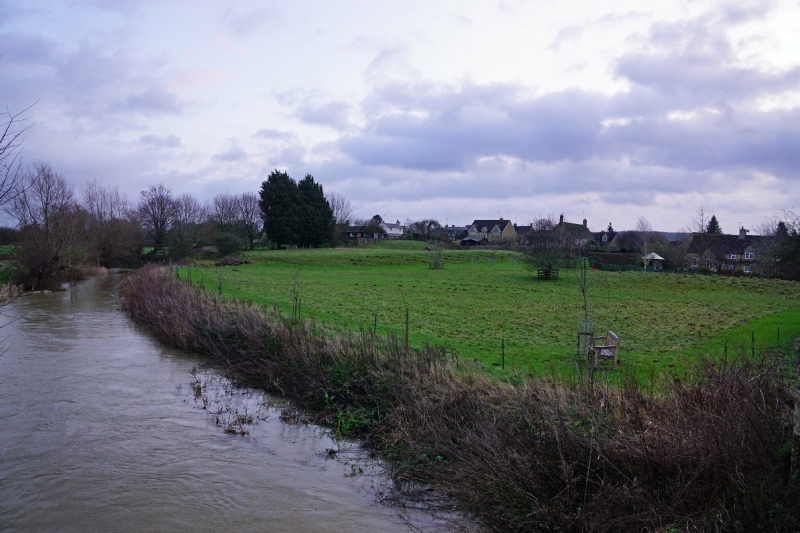 Both built on the banks of the River Evenlode, they were held by opposing sides during the Anarchy. Wychwood was a Royal forest used by Saxons and later Normans. 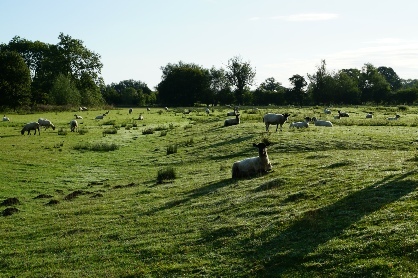 The primary settlement in the area was at Shipton but, by the time of the Norman invasion, there was some form of community at Ascott; the name derives from the Saxon for "East Homestead". Its proximity to the forest made it prime real estate for the new arrivals and soon two manors had become established under different Lords. The manor that became Ascott d'Oyley was granted to Robert d'Oyley by William I (the Conqueror) for his services during the Norman invasion. He had accompanied William and had fought at the Battle of Hastings (1066). However, there is no evidence to suggest a castle was raised at this time and instead documentary evidence points to construction between 1129 and 1150. By then the manor was owned by Robert d'Oyley, a descendant of his namesake, who had married Edith Forme - a former mistress of Henry I and mother to Robert, Earl of Gloucester. When civil war (the Anarchy) started in 1139 between King Stephen and Matilda over the succession to the English Crown, the latter's principle supporter was Robert, Earl of Gloucester. Inevitably Robert d'Oyley's association with the Earl would have led to his properties becoming embroiled in the fighting (his property as Swerford was also fortified at this time). Constructed on the southern shores of the River Evenlode, the castle was a motte and bailey fortification. The mound itself was built around a square stone tower with walls over 2 metres thick. The bailey was configured into a broadly rectangular configuration and surrounded by a ditch. A small settlement, which developed around the castle, became established to the immediate west of the bailey. The entire castle stood in close proximity to Ascott Earl Castle, which guarded over an adjacent estate at the other end of the village. The tower was partially demolished in 1175 although some of the masonry was re-used in a manor house started in some form no later than the thirteenth century. This structure was subsequently extensively updated in later years with much of the current remains dating from the seventeenth century. The original outer bailey of the castle was laid out as formal gardens around this period. Unlike the history of Ascott d'Oyley Castle, much less is known about Ascott Earl. It is believed to have been built by Waleran de Beaumont, Earl of Worcester (1104-1166). Upon the death of Henry I in 1135, he became a supporter of King Stephen and his estates became a key target for Matilda's forces at the outbreak of the civil war (the Anarchy) in 1139. It is probable that he raised Ascott Earl Castle at this time particularly as the adjacent manor of Ascott d'Oyley Castle was held for Matilda and was also being fortified. Constructed as an earth and timber motte-and-bailey castle, it re-used an existing Iron Age earthwork. The mound itself was topped with a wooden palisade whilst the bailey was a crescent shaped enclosure surrounded by a ditch. It seems likely the castle's entrance was on the east side with access to what is now the modern Shipton Road that would have connected the adjacent settlements. Whilst Waleran dealt effectively with threats to his English properties, the Angevin faction - headed by the future Henry II - made extensive attacks on his continental estates eventually forcing him to reach a settlement with Matilda. However, he was not reconciled with Henry II, who ultimately stripped him of his earldom and castles. Most of the latter, most likely including Ascott Earl Castle, were destroyed in the subsequent years as part of the new King's purge of unauthorised fortifications. The manor house at Ascott d’Oyley was built within the earthworks of the earlier castle and includes some masonry robbed from the structure.